Welcome to our website. We are the Shrewsbury Sno-Birds, the VAST Snowmobile Club of Shrewsbury, Vermont. The Club consists of a group of volunteers that put in great efforts to maintain the trails, organize functions, educate the public, and much more! We are a non-profit organization of dedicated snowmobiling enthusiasts who are as concerned about trail quality as we are about riding the trails. This was demonstrated in the weeks following Tropical Storm Irene when club members repaired the considerable damage left by the storm. We spent more than 240 hours of equipment time to rebuild our trails and repair or replace 7 bridges. See the damage and the repair work to get an appreciation for the extent of the Irene caused problems in our photos on SmugMug. Though not all trails could be opened for the 2011/2012 season, the most crucial trials were ready but… as you may remember, the winter snows never really arrived that season. You can review the entries in the Trail Reports of our blog and see what happened or rather what didn’t happen! Lets hope another La Niña weather pattern doesn’t spoil any more winters to come! Why Support Our Club with Your Membership? You may or may not know of our trail grooming reputation but if you have been across our territory on a sled you may have noticed some exceptionally smooth grooming. This is a result of well thought out trail building and maintenance operations and experienced groomer operators. Are there grooming fanatics in the club? You decide. We groom at least twice a week religiously to keep our trails as smooth as possible, grooming straight thru the night to keep up with the traffic. We built a new, main link trail, we call Corridor 407, in 2010 and the high praise we got for the grooming was… well we heard the word phenomenal used by several folks and that just makes our day! The VAST Trails Coordinator once asked our Trails Coordinator, Roy Arthur, why were we out grooming when the trails were so smooth? Roy replied, “There are sections that were not quite that good so if you get out there and cut off a six-inch mogul it will get better, if you wait until it gets to eighteen inches, it won’t stay anywhere as good.” The Sno-Birds’ two main groomer operators have been grooming Shrewsbury trails since the early 80’s when it was privately groomed and now for the club, since 2000. Often club members ride along and try their hand at it. When asked about his grooming philosophy, Roy gives all those who work on the trails credit when he says, “Our thoughts on grooming are, it is not a race. We are out there for the members no mater how long it takes! 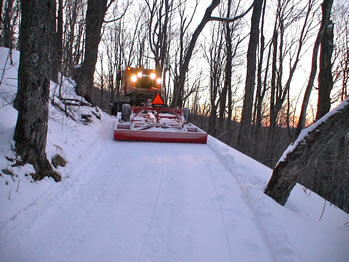 Our extensive trail construction efforts do make it easier for the winter grooming. We need less snow to get started with grooming and the trails stay better, longer in the spring.” Need another reason to join our club? The Shrewsbury area is relatively high in elevation so gets more snow than other regions. Key words: MORE SNOW! We encourage all interested to attend our monthly meetings from August through April, with summer meetings when needed. The meetings are the second Tuesday, 7:00 pm at the South Side Resturant on 117 South Main Street in Rutland. Come and join us! For information call (802) 779-5228 or send us an email message.